This 8 day holiday takes you directely into the heart of the Inca empire (Tawantinsuyo) once the most powerful in the southern hemisphere ! Cusco - the old Inca capital is the main destination of everyone's trip. Sat at 3300m / 10,827ft. above sea level, Cusco has a unique charm and provides an interesting mix of Andean and Spanish cultures. Filled with ancient Inca sites and colonial buildings sat alongside modern restaurants and upmarket cafes, Cusco has a little something for everyone. The Inca Trail, words can not describe the experience one goes through an amazing 4 days camping in the peruvian andes; ruins as in the days of their glory, valleys, tuinnels, cannyons, high passes, etc. You must experience yourselve the famed Inca Trail to understand the true meaning of an Inca pilgrimage. Machu Picchu - the 'lost city of the Incas' only know by the modern world from 1911. Surrounded by breathtaking mountain scenery and with some of the most impressive Inca buildings ever constructed, Machu Picchu is the highlight of Peru and south america! VERY IMPORTANT: If Inca Trails spaces are SOLD OUT an Alternative trek or Machu Picchu by train are the back up options. Please let us know. * Accomodation: 4 nights in 3* hotels. * Return transfers: Airport-Hotel- Airport. VERY IMPORTANT: If Inca Trails spaces are SOLD OUT an Alternative trek or Machu Picchu by train are the back up options. * Lunches and dinners in town. * Drinks and other bar bills. * Extra snacks on trek and drinks. 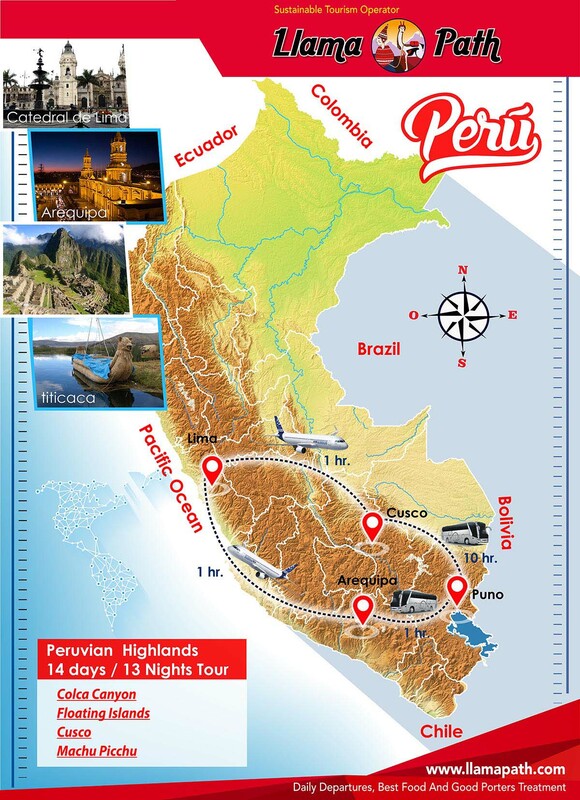 * Wayna Picchu or Machu Picchu mountain climbing fee (extra USS $ 85)needs to be booked well in advance. You will stay in 3* Hotel category in double occupancy (Rumi Punku, Encantada or similar). On trek you will be using tents (2 people enter in each 4 persons tent) Single tent suplement on request (USD $ 35.00). VERY IMPORTANT: If Inca Trail spaces are SOLD OUT an Alternative trek or Machu Picchu by train are the back up options. VERY IMPORTANT: If Inca Trails space are SOLD OUT an Alternative trek or Machu Picchu by train are the back up options. B. Let us know if you have any special dietary requirements or medical conditions that we should know about. C. Pay a deposit of 50% of the total tour, the rest can be paid 2 weeks prior trip departure. - PAYPAL: Go to www.paypal.com and if you have an account, enter your account information (username and password). Choose the option ´send money´ to: deposits@llamapath.com Please confirm by email that you have sent your payment this way. D. I / we accept your terms and conditions (https://www.llamapath.com/en/terms-conditions) ( ) Please write YES within brackets.